Nicolas Rolin, whose name you read in the title of this painting, wasn’t just your average 15th century social climber. Though he had been just a simple boy from humble means, Rolin earned some major social capital when he was made a chancellor to Philip the Good, Duke of Burgundy in 1422. ‘Course, being influential and powerful in the world wasn’t enough for this aspirational fellow. 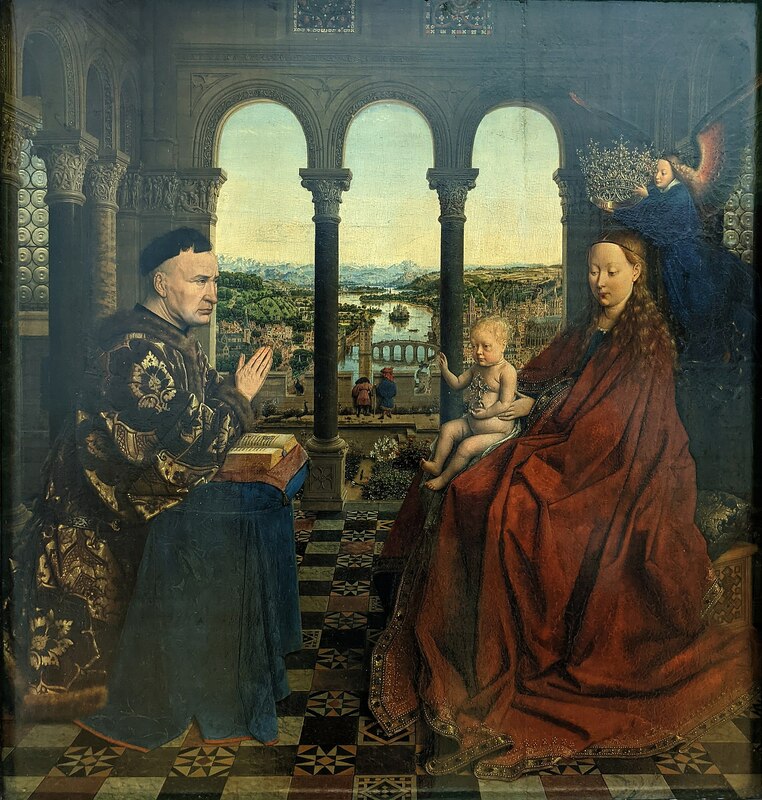 So he had this portrait of himself commissioned next to what was at that time considered THE coolest peeps to have ever graced God’s green earth: Mary and JC, of course! The middle-aged Rolin’s alert gaze may seem charged by several espresso shots, but before you reach for that bag of dark roast, know this: this is the look you get when you’ve spent many hours praying and reading the good book. So break out the Bible instead, folks, and replace those coffee beans with some rosary beads. Plus, you gotta look that perky when their Holinesses are paying you a visit. Probably also why Rolin wore his good mink-trimmed brocade jacket that day. He still can’t hold a candle to young JC, who is in the buff with an angel hovering nearby with a bangin’ crown to tell the world that he is, inarguably, the king. Also, if you squint really hard, you see two peacocks out on the terrace that were supposedly symbols of immortality. Or the fact that Rolin could dole out the ducats to pay for fancy birds, both in the painting and in real life. Even though the figures are painted like, super well, the really awesome feature of this painting is the background and the landscape. First of all, hello spatial depth! Look at that tile work that recedes so beautifully and convincingly. Not too shabby for a Flanders man, van Eyck! Then there’s the landscape you see (if you squint even harder, or use the zoom tool if you’re smart). I can’t even with all that crazy detail! There are little towers, a twisty river, houses, teeny figures, a cathedral, and lots more! The landscape stretches out into a hazy distance to give us the impression of its mysterious continuity, and also to remind us that van Eyck knew his oil paints better than anyone in that day and age. Charles de Tolnay, art historian to the stars, said that the painting represented a comprehensive vision of the entire universe. Couldn’t have said it better myself. Check out the full Wikipedia article about Madonna of Chancellor Rolin.